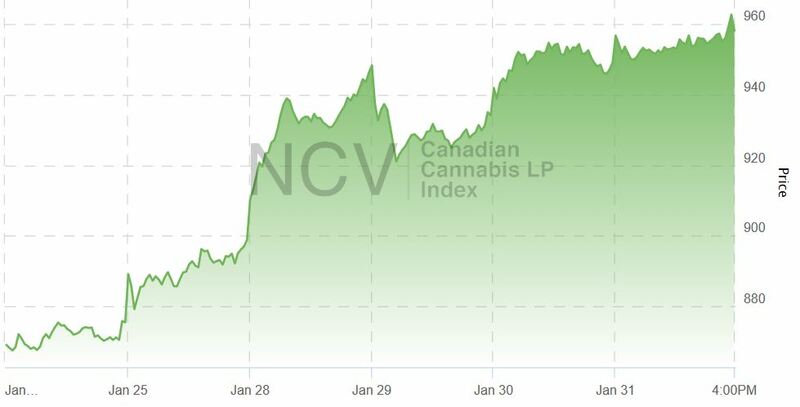 The biggest stories of the month included additional consolidation, with Aurora Cannabis (TSX: ACB) (NYSE: ACB) agreeing to buy organic cannabis producer Whistler for $175 million in stock and Tilray (NASDAQ: TLRY) agreeing to buy greenhouse grower Natura Naturals, and Canopy Growth announcing its entry into the U.S. hemp market after obtaining a hemp license in New York. Additionally, Tilray struck a deal with Authentic Brands Group to develop and market consumer cannabis brands. The index, which included 45 publicly-traded licensed producers that traded in Canada at the end of December, with equal weighting, is rebalanced monthly. Each of the members is also included in a sub-index, with four in the Canadian Cannabis LP Tier 1 Index five in the Canadian Cannabis LP Tier 2 Index and 36 in the Canadian Cannabis LP Tier 3 Index during the month. 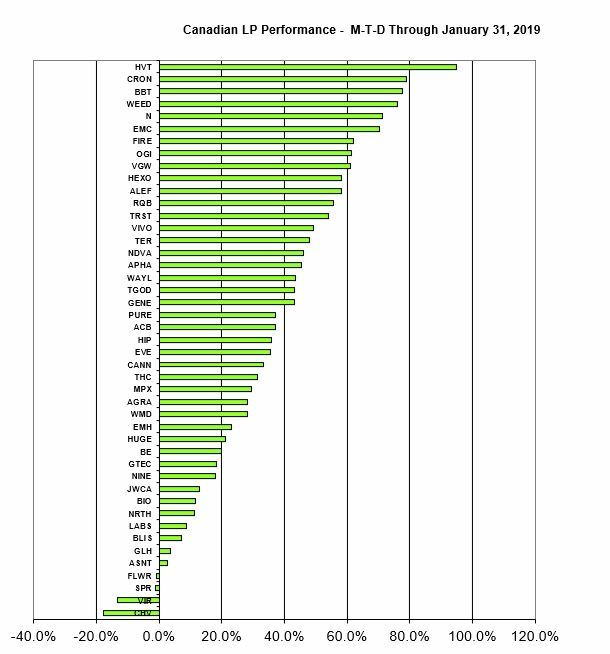 Tier 1, which included the LPs that are generating sales of at least C$10 million per quarter (in 2018, we used C$4 million as the hurdle), rose 53.1% in January after declining 7.7% in 2018. This group included Aphria (TSX: APHA) (NYSE: APHA), Aurora Cannabis, CannTrust (TSX: TRST) (OTC: CNTTF) and Canopy Growth. Within the group, Aurora had the worst return at 37.2%, which was still above the return of the entire sector, while Canopy Growth posted the highest return at 76.0%. Aphria rebounded 45.4%, while CannTrust gained 54.0%. Tier 2, which included the remaining LPs that generate quarterly sales between C$2.5 million and C$10 million, rose 59.3% after declining 35.0% in 2018. This group included Cronos Group (TSX: CRON) (NASDAQ: CRON), HEXO Corp (TSX: HEXO) (NYSE American: HEXO), Newstrike Brands (TSXV: HIP) (OTC: NWKRF), Organigram (TSXV: OGI) (OTC: OGRMF) and Supreme Cannabis (TSXV: FIRE) (OTC: SPRWF). Cronos Group rose 79.1%, with Supreme, which is moving to the TSX on February 4th, and Organigram both gaining more than 60% and HEXO rising 58.1%, while Newstrike, the worst performer, nearly matched the overall market return, gaining 35.9%. Tier 3, which included the 36 LPs that generate quarterly sales less than C$2.5 million, rose 30.8% after declining 26.4% in 2018. 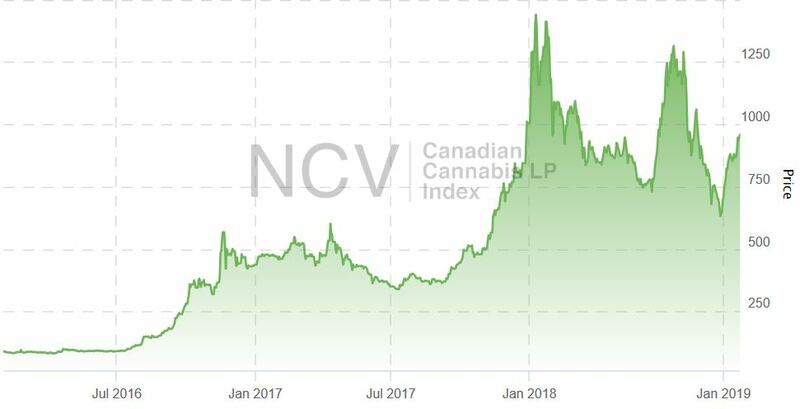 The best performer was Harvest One (TSXV: HVT) (OTC: HRVOF), which ended 2018 trading at tangible book value and began the year by getting an OTCQX listing. Harvest One rose 94.9%. All four of the stocks that declined in January were Tier 3 names, including Canada House Wellness (CSE: CHV) (OTC: SARSF), Viridium Pacific Group (TSXV: VIR) (OTC: VIRFF), which was halted in trading early January due to a pending merger, Sproutly (CSE: SPR) (OTC: SRUTF) and Flowr Corp (TSXV: FLWR) (OTC: FLWPF). For February, the overall index had two changes, with Zenabis (CSE: ZENA) joining after its recent reverse-takeover and MPX Bioceuticals (CSE: MPX) (OTC: MPXEF) exiting as it completes its asset sale and issues shareholders stock in MPX International. Additionally, Organigram moved from Tier 2 to Tier 1 for February after reporting sales of C$12.4 million for its quarter ending November 30th. Readers should be aware that Tilray, with no Canadian listing, is not eligible for inclusion in the index, which is denominated in Canadian dollars. In the next monthly review, we will summarize the performance for February and discuss any additions or deletions. 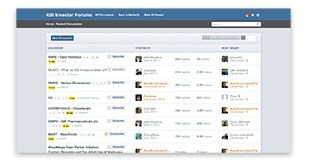 Be sure to bookmark the pages to stay current on LP stock price movements within the day or from day-to-day.